I eventually inherited these components, and (because I was a fool) I gave them away when I had some considerably more modern equipment. Eventually, I came to my senses and went back to the person I gave them to on my figurative knees and got them back. The amplifier had died in the interim (about 20 years) and I had to cobble up a power resistor from spare parts I had lying around. Both the tuner and amp are now alive and healthy, and I'm happy as can be. About 30 watts (2 6L6's in class AB). These components are one of the reasons the "tubes-over-transistors" crowd has a justification for existing. Scott, along with Macintosh and a (very) few other companies, produced some truly outstanding consumer audio gear during the 50's. I'll say one thing for my dad, however he picked these components, he hit the proverbial nail on the head. Great stuff! (I apologize for the lousy images... I need a better digital camera and/or some better lighting) In my office. I used to have another one of these. I lived in Port Jervis, New York at the time in a tiny one-room apartment; the sound was fantastic, and I used to go to sleep at night to pure audio bliss. 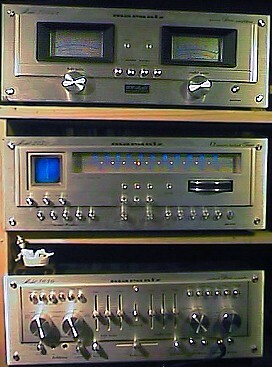 I sold that unit; but I found another in May, 1998 at the same pawnshop where I found my Marantz 2240 (below). It sounds just the way I remember. It's in perfect shape, and I got it for $60.00, which I consider more than a bargain. Original sold. Replacement acting as the sound system for Justin, the resident 17-year old entity. A high power system, very nice for its day. Stolen. A very high power system for the time - Nice! 160 watts RMS / channel into 8 ohms. I purchased this to replace the stolen SX-1050, and got more than I bargained for. It was a much better receiver as well as offering considerably higher power. Recently, I located another SX-1250 on EBay, which I kind of haunt now. Original sold. Replacement unit is in the master bath in my home, where it drives a 12 inch passive subwoofer and two small satellites. There's a video monitor in there, and we broadcast the main system on 102.7 FM, so the Pioneer serves as the FM to audio portion of the A/v system in the bath. A great receiver - medium power, great sound. This thing was near the sliding doors on my patio in south Florida when a torrential rainstorm soaked it. I dried it out, but it was about a week before it would turn on again, and stay on. It survived, but just barely. Probably needed a bath in some solvent. On lend to my good friend Mike, it finally died in a profound and final way - smoke, flames, and etc. Rest in pieces. Just prior to home theater, this is great gear. The bedroom sound system. Pioneer Dolby Pro-Logic Pioneer Dolby Pro Logic laserdisc, VCR, Dual-well cassette, linear tracking turntable, two tower speakers, two surrounds, powered subwoofer, center speaker, C-band satellite system, 28-inch monitor. 4-6-7 This is a nice machine - but in common with the Technics, the controls are kind of poorly thought out. My ex-wife has this entire system, and she really likes it, reasonably enough. The remote has no way to select the turntable; but it has buttons for some really obscure things not even on the receiver (VCR controls & etc.). You can't set the level of the surround or center channel speakers except from the rear of the receiver - that's really annoying if your surrounds are not matched, as is the case in my setup. No EQ, just bass & treble. I have a Technics VCR, which is on all the time. It takes the DSS and feeds it thru as the "line" input, so I have to leave it on (I don't mind, I prefer to leave things running anyway.) But... if you pressed the Technic's remote's VCR1 switch, it toggled the power on the VCR, so you are turning it off, which shows an amazingly, totally, completely dumb design decision somewhere. I bought this to replace the Technics (above). This has four sets of S-VHS inputs, and I have three S-VHS sources (DVD, VCR, DSS); the Technics was all composite video. This runs cooler, has a better set of features from the perspective of how we tend to use the living room system, and generally meets my needs at this point. Update, early 2000: I am using a Technics integrated amp as a subwoofer driver on this system now... that's 180 honest watts RMS to the sub... since the JVC receiver allows you to tell it you're using an active sub, the power it has to distribute to the mid and treble in the other five channels (300 watts or so) is way more than suffcient. This thing will blow you out of the house now, and never mind about getting a more powerful Dolby system. :) The living room system. You know what's really scary? I got this thing for $20.00 & a display counter I built (worth nothing to me). The 2240 came from a pawnshop, they wanted about $100.00 for it, but they gave me $80 credit for the counter... (laughing maniacally). The FM was seriously out of alignment, which I fixed in a couple of very late-night sessions, and some panel lights were out, which I fixed. I found a place that has both service manuals for it and the panel lights, ordered and received same. Sold to my sort-of-son, Brian. This receiver sounded just excellent. It's flexible, reasonably powerful (more than we needed in the office) and it's also, to my eye, quite attractive. Classic, even. I frequent EBay, an online auctioning site. It's a really neat place, you can find some amazing things up for auction, and the system they use to control the auctions is really very good, all things considered. If someone outbids you, EBay sends you an email immediately, so you can re-bid. Well, I spotted this Marantz one day and just knew I'd love it to death if I could get it. So, I placed a bid, as the price was absurdly low to start with - under a hundred dollars. Well, pretty soon it was nearly $200.00, and I was getting a little nervous; I hadn't re-bid, because I didn't want to participate in driving the price up, at least not till the end time for the auction drew near. About an hour prior to the end of auction, I put in a bid for $225.00. No more bids appeared, and I thought I had it. I set up a bid for considerably more (I would have paid $500.00 for this puppy) and waited without clicking on the "submit bid" button in the browser. I had my email up and running, and checking once a minute. One minute prior to the end of the auction, someone else outbid me on the unit. About 30 seconds before the auction ended, I got the email notification of this. Egadz! You know I hit that form button quickly (I had my hand right on the mouse when the email program dinged me). Well, my bid got in with exactly 20 seconds to spare, and I got the unit. The other person and I exchanged a couple of friendly emails about it (in the course of which I learned a few things about bidding on EBay) and within about 5 days I had it up and running here. My outgoing bid submission had to make it to California within this same minute to win. This, as far as I am concerned, is about as good a classic audio system as any person is ever likely to own. The 300dc Amplifier is 150 honest watts RMS per channel, is "DC to daylight" bandwidth-wise, the 3650 preamp has more sonic control than you're ever likely to need, and the 2130 tuner just cleans the competition's clock. The tuning scope is not only fun, it's really useful. There's absolutely nothing that helps point an FM antenna accurately as well as a multipath display on a scope. So, why the "9" on the features? Well, it's like this. I can imagine a "perfect" stereo, and it would have a number of features not present in this setup (or any other I've ever seen). So I leave room for someone to do better. Curious as to what I'd like to see? Click here. The current office sound system. Over on the immediate right at the bottom is the antenna that's on the office system. It's an APS-14, a large, 14-element, dual-driven director-only design that pulls in KMHK, a classic rock station 179 air miles away in Hardin, Montana fairly reliably, as you can see at the right top. That's a full quieting signal about 99% of the time. Afternoons, skip does tend to come in and whack KMHK upside the head, but that's actually kind of fun. If you click on the thumbnail on the bottom, you can see a 4x version of the antenna image. That's my friend Mike on the tower below the antenna. 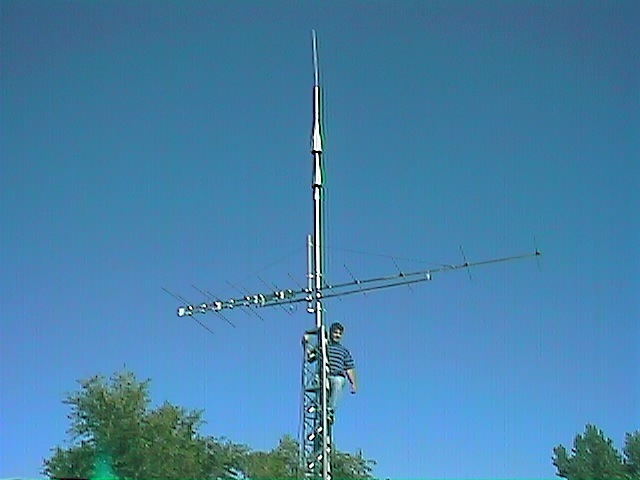 He's six foot even so that should give you an idea of the scale of the antenna against the tower, etc. I've got an inline coaxial amplifier up by the tower so as to reduce losses in the 50 feet of coax it takes to reach the office system from the antenna position. The tall pointy antenna above the APS-14 is an AEA "Isopole", a 144-MHz design that is omnidirectional and listens at the horizon level. I use it to catch DX conditions on FM, though it's detuned at 88-108 mhz, it still does a very credible job on the FM broadcast band. I sometimes listen to 2 meter HAM FM & packet also.